I’ve written before about how I first learned about sensory play and why I think it is so important for kids. As long as my kids continue to enjoy sensory play – and so far they still love it! – I will continue findings ways to incorporate it into our regular routine. 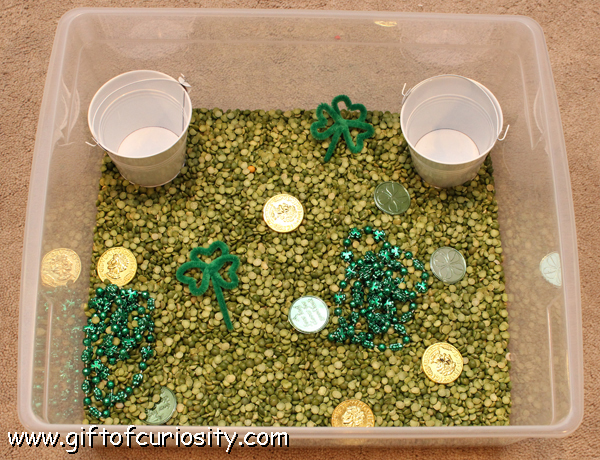 With St. Patrick’s Day fast approaching, I knew I wanted to create a St. Patrick’s Day sensory bin for my kids. So I dug up some leprechaun gold from the basement and some dried split peas from my cabinets. Tossing them together with a few other items made a wonderful sensory bin for St. Patrick’s Day that my kids really enjoyed getting to play with. Plus, as I share below, my husband brought some spontaneous science learning to the kids’ adventures that really wowed them. Note: This and other St. Patrick’s Day activities can be found on my St. Patrick’s Day activities for kids page. You can also find a complete list of the sensory bins that have been featured at Gift of Curiosity on my sensory play page. 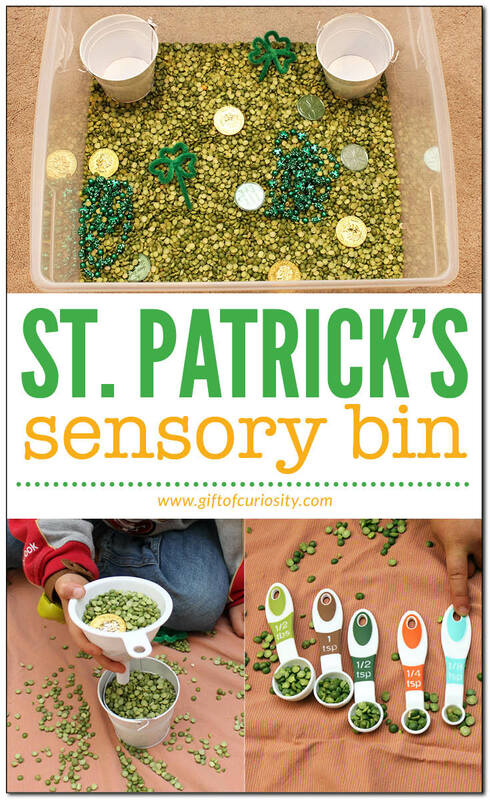 With St. Patrick’s Day coming up, I thought that a St. Patrick’s Day sensory bin would be a great way to introduce my kids to a bit of the lore surrounding the holiday. That’s why this bin is all about green and gold! To get a green sensory bin, I chose dried split peas as the base material for this bin. I then threw in some St. Patrick’s Day necklaces left over from a previous year, two pipe cleaner shamrocks, and two white pails. I topped the bin off by adding some some green and gold leprechaun coins . 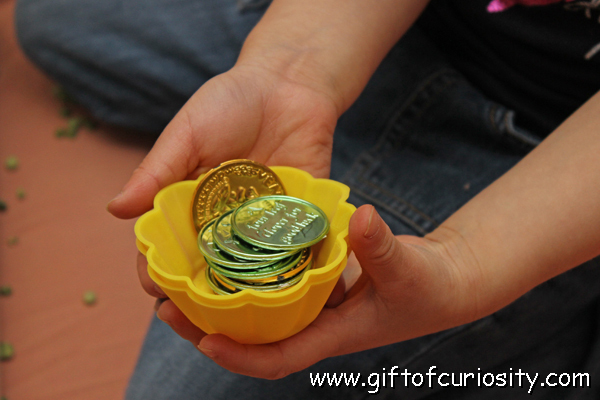 I left some of the coins on top, but I buried a number of other coins in the split peas for the kids to find. After spreading out a sheet to contain the mess, I let the kids explore the bin. They quickly took out all the items sitting on top, and then they started digging their hands in to find the hidden gold. XGirl collected her gold in one of our silicone cupcake liners . 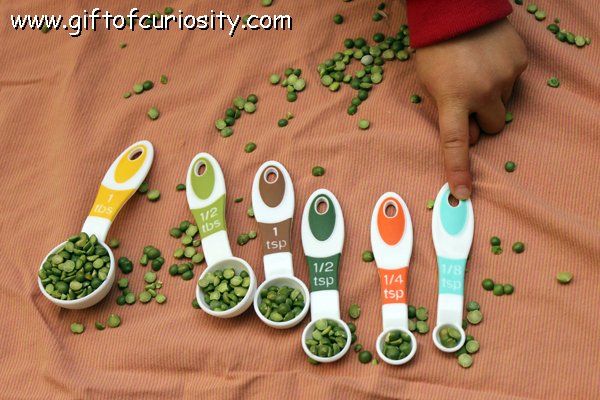 QBoy began filling all of the measuring spoons with split peas. Then he decided to put them in order from largest to smallest. 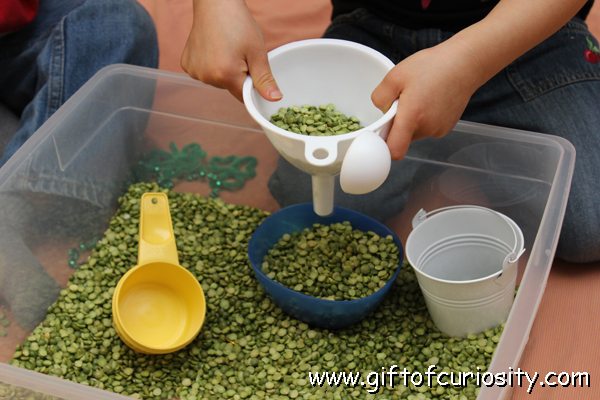 As you can see, the learning possibilities with this St. Patrick’s Day sensory bin are practically endless! 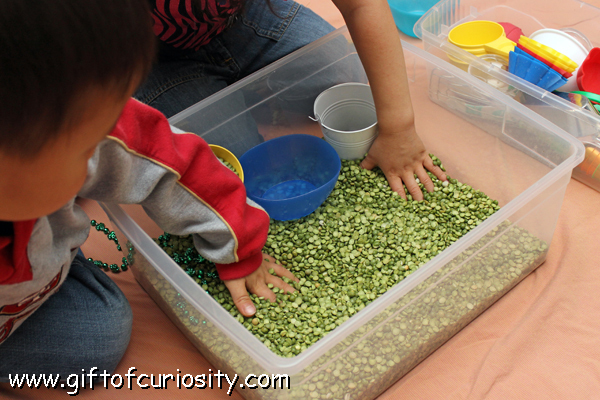 We also made a sensory bin using green split peas for Saint Patrick’s Day and my kids loved it! This looks beautiful and so much fun! Great activity to practice measuring! Split peas are a great choice for St. Patrick’s! Thanks for stopping by! I love this idea! Split peas make a wonderful choice as a filler! I am sad to say we did not do a St. Patrick’s Day bin or much learning for this holiday! I did do some tot trays but that’s it. Been a little busy with a new crawler:)Thanks for linking up to the Thoughtful Spot Blog Hop. Hope to see you next week! What a cute idea using green peas instead of colored rice! I love this idea and I have featured your article on Mom’s Library this week at Pounds4Pennies. I hope to see you there this week.